"It is stated that nothing is more revealing of a woman's character than her dressing table..."
"The average woman is proud of her dressing-table, the toilet appointments, besides being necessary are nowadays a source of beauty." Does that sound a bit old-fashioned? That's because it was taken from an article written in 1937 for the New Zealand Railways Magazine! I visited a client recently who needed help deciding how to arrange all of her furniture since moving from her large home in the South to a little apartment in California. The one piece of furniture that she would not get rid of in her bedroom was the vanity. She sat there every morning and applied her makeup and styled her hair! I suggested that she could do that in her bathroom like I do. 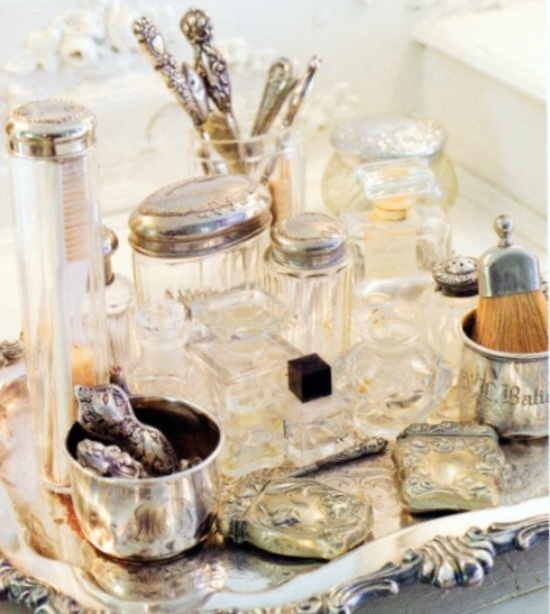 But being an old-fashioned southern girl, she was not letting go of her dressing table! I wish I had a dressing table now! Mine is technically the bathroom counter where I've at least gathered all the elements together. Of course, it doesn't always look like this, since I have to share the space with my husband! Perhaps my client was on to something! 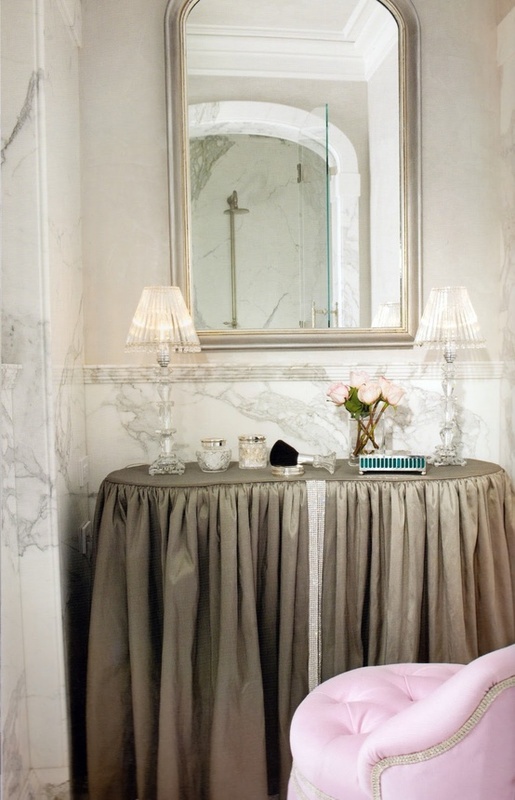 Wouldn't it be a luxury to have your own personal vanity? It wouldn't have to be elaborate. A simple skirted table would work. A romantic skirted table like this one! 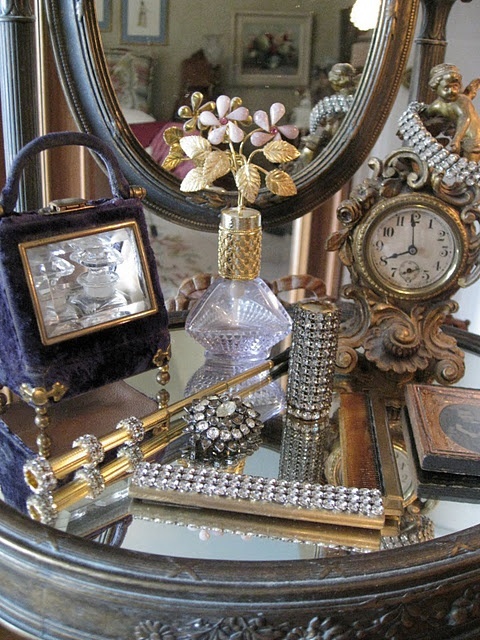 Just add my antique mirror, perfume bottle collection and voila! What are your feelings about dressing tables? I'm thinking an old-fashioned necessity! 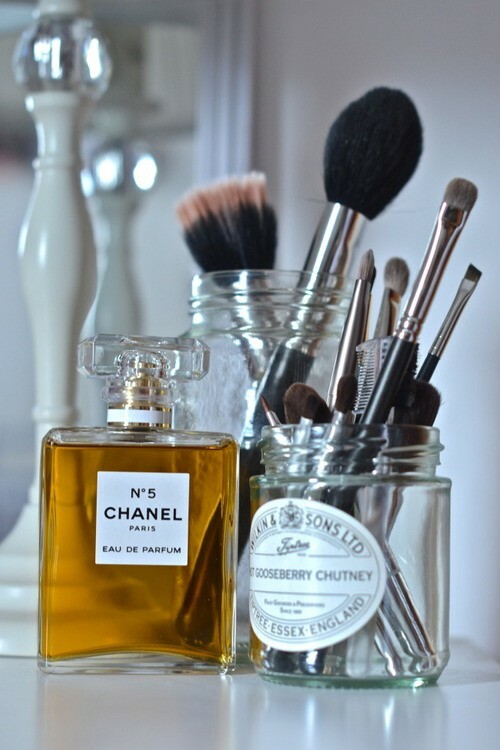 For more Dressing Table inspiration, visit my Pinterest board here. I loved seeing all those beautiful dressing tables and will certainly visit your pinterest. There was no room for my mother's small secretary desk in my new home so I put it in my small walk in closet. I am using it as my dressing table, something I have never had before. I love it because it tends to get cluttered and I simply close up the lid :) I plan on sharing this in the near future. I always love visiting your beautiful blog! Thanks Bunny! I can't wait to see your dressing table. What a great idea to put it in your closet. Loved looking at all these romantic images. 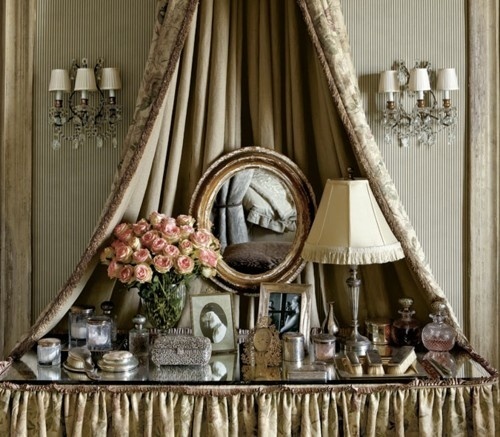 Since I am such an edited girl I probably won't have a dressing table, I couldn't stand that much stuff out to be seen, but I truly love seeing images of them so this was a real treat. I'm so glad I added mine several years ago, now I can't imagine doing without. It just feels so much more elegant to SIT and enjoy applying my make up and fiddling with hair clips or whatever. Even on my hurried workday mornings...it makes all the difference. Plus it's a fun spot for the granddaughter to PRETEND. It's the first thing she does whenever she visits Grandma. You are right Delores, they are romantic and elegant, should most certainly be revived! These are lovely Delores, I wish I had the space for it..thanks! We Southern ladies of a certain age do require a vanity for our vanities! I have never been able to put on make up or do hair standing up. These are beautiful examples. I was admiring your perfume bottles -- you have a great assemblage. You are nearly there -- now put all that on a pretty table and get a girly chair! I was thinking the same thing! An old fashioned necessity! Beautiful post! It makes me want one now, as well! Have a great weekend! 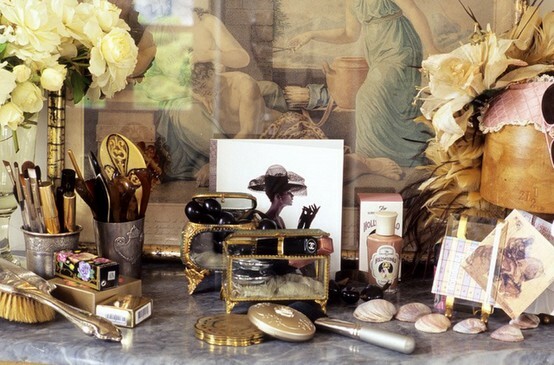 I have always had a dressing table for my makeup and fragrances. I love it! I have two kidney shaped bases tucked away in storage waiting for skirting to be made - they will adorn my dressing area in our new home, and in my Granddaughters room when she visits. Of the various tables I've had/have - the skirted one is my favourite. Oh my goodness Vanna! That photo has so inspired me. Didn't know it was yours. So beautiful! Thanks for the inspiration! ..hei,es ist wunderschön diesen tische zu sehen...entzückend!Schöne woche wünsche ich dir.Bussi.Lu. 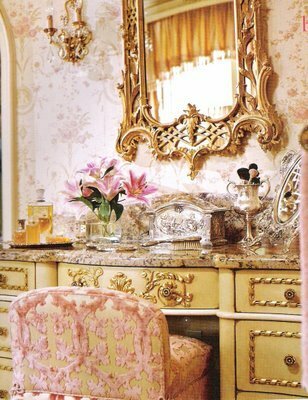 Yes YES...I want a dressing table instead of my bathroom counter...I do have a demi-lune table with my bath oils and perfume bottles by the bath tub...it was my mom's and makes me happy. 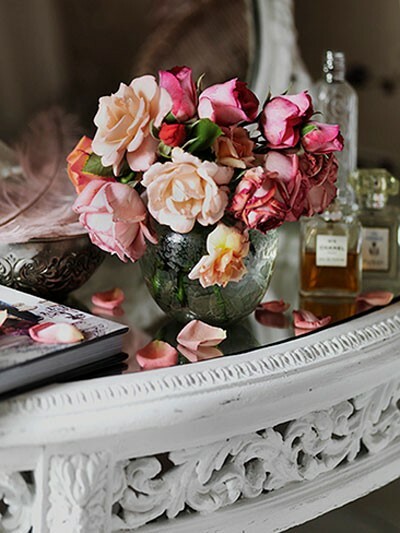 PS...it would be so fun to have all those pink roses like in the last photo on my own vanity. Ohhhh, you got me thinking. I saw a picture of your client's vanity and then saw some other pictures with pretty oval framed mirrors. I have a very heavy one I picked up at a thrift store...and I think I will lean it up my bathroom corner vanity mirror that I use as a "vanity." Always enjoy your blog and beautiful photos. 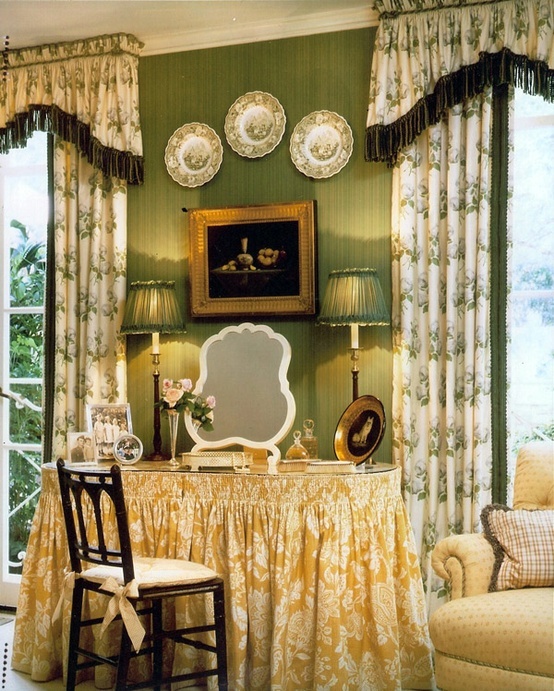 I love the romance of a dressing table and just purchased one for my bedroom. I am in the process of painting all the furniture and giving the room a bit of a do over. I must get buzy at it. I just love everything about this! It is so elegant! I didn't realize you were on Pinterest!!! How much I have been missing out on I am SURE! I just pulled up your page and will be digging through the boards soon to find lots of inspiration for my own home when I get married! Oh wow! How unique and wonderful this looks! I love everything about it! I didn't realize you were on Pinterest! How much I have been missing OUT!!! I will be digging through your Pinterest boards soon to find inspiration for my own home when I get married soon!